An association was investigated between changing infant feeding practices and a declining incidence of childhood coeliac disease and transient gluten intolerance (TGI) in West Somerset, England during 1971–92. Dietary histories of 18 patients with coeliac disease were compared with 23 controls during 1971–80 and eight patients with coeliac disease and 39 controls during 1981–92. Our findings showed that the declining incidence of coeliac disease and TGI were associated with changing infant feeding practices, characterised by the later introduction of dietary gluten, an increased use of baby rice and gluten free foods for weaning, and an increased incidence of initial breast feeding. The incidence of coeliac disease in childhood has declined in England,1-4 Scotland,5 and Ireland6 over the past two decades. However, in Italy, the incidence has been unchanged,7 and probably in Finland,8 where patients increasingly present with mild or atypical symptoms and signs of coeliac disease, at school age or during adolescence. In Sweden, the incidence of coeliac disease has increased since 1982.9 10 The reasons for these conflicting trends are unclear, with genetic and environmental factors being implicated, including the age of introducing dietary gluten in infancy.11 In this study we have investigated the influence of changing infant feeding practices on the incidence of childhood coeliac disease and transient gluten intolerance (TGI) in West Somerset, during 1971–92. West Somerset had a mean annual population of 263 000 (51 600 <14 years) during 1971–92 and a mean number of live births of 2700 per annum. During this period, 39 children with a history of coeliac disease (22 boys, 17 girls; median age = 16 months, range = 3 months–13 years 8 months) were admitted to the children’s unit, Taunton and Somerset Hospital for further investigation. Peroral small intestinal biopsy specimens showed villous flattening by light microscopy, and they responded clinically to treatment with a gluten free diet. An initial diagnosis of coeliac disease was made and later confirmed on 16 patients (six boys, 10 girls), according to criteria of the European Society for Paediatric Gastroenterology and Nutrition (ESPGAN).12 A further 10 patients (five boys, five girls) were diagnosed with coeliac disease according to revised ESPGAN criteria.13 The age of presentation of coeliac disease in all patients was the time of their initial biopsy and the cumulative incidence of coeliac disease was the number of patients per 1000 live births, calculated for each birth cohort. Dietary histories during infancy were obtained on patients and controls by a paediatric dietitian. The numbers of infants initially breast or bottle fed, the age of introduction of dietary gluten, and the types of solids used for weaning were determined. Controls were children admitted to hospital in whom coeliac disease was excluded and 23 were studied between 1971–80 (16 boys, seven girls; median age = 15 months) and 39 between 1981–92 (19 boys, 20 girls; median age = 22 months). Grade 1—villi of normal height, normal epithelial cell appearances, and a normally cellular lamina propria. Grade 2—villous flattening varying from mild to moderate, loss of epithelial cell height, and increased cellularity of the lamina propria. Grade 3—a flat mucosal surface with a cuboidal epithelium and heavy cellular infiltration of the lamina propria. Altogether 26 children with coeliac disease were diagnosed between 1971–92 (11 boys, 15 girls; median age = 15 months; range = 4 months–165 months (13 years 9 months)); 18 during 1971–80 (median age = 13 months; range = 4 months–156 months (13 years) and eight during 1981–92 (median age = 21 months; range = 9 months–165 months.13 The annual incidence of coeliac disease peaked in 1974 and then declined, and no patients were diagnosed annually for six years between 1980–92 (fig 1). The cumulative incidence of coeliac disease was 0.68 per 1000 live births in children born during 1971–80 and 0.09 per 1000 live births during 1981–92. 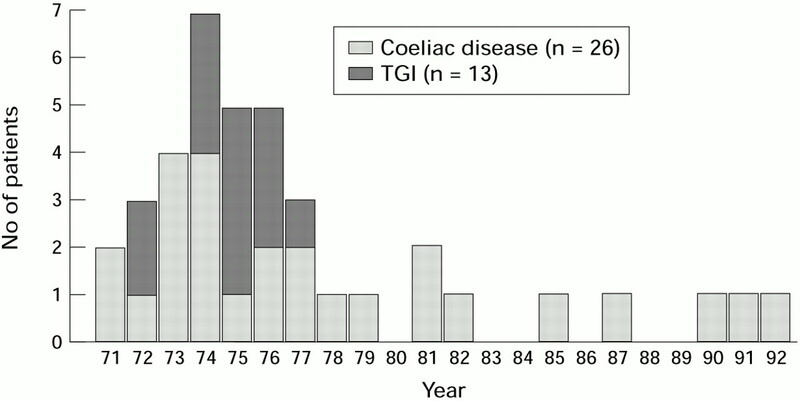 The incidence of coeliac disease and TGI in West Somerset (1971–92). Of the 39 patients first diagnosed with coeliac disease, 13 (11 boys, two girls; median age = 9 months, range = 3–44 months (3 years 8 months)) showed grade 3 histopathological changes in three and grade 2 changes in 10, but had a negative gluten challenge. They were diagnosed with TGI, but not all criteria for making this diagnosis were fulfilled,14 15 and food allergies were not excluded. Five patients were initially breast fed and eight bottle fed, and gluten was introduced at a median age of 3 months (range = 1–9 months). The incidence of TGI declined during the early 1970s and no patients were diagnosed after 1977. Data on the age at which particular events occurred are medians with 95% confidence intervals (CI). Statistical analysis of differences between groups was obtained using the Mann-Whitney U test. Table 1 shows that patients with coeliac disease during 1971–80 were diagnosed at 13 months and during 1981–92 at 21 months (p=0.09). Gluten was introduced to coeliacs at 3 months during 1971–80 (95% CI 2.3 to 5.0) and at 5.5 months during 1981–92 (5.0 to 7.3) (p=0.01). Gluten was introduced to controls at 3 months during 1971–80 (2.0 to 3.0) and at 5.5 months during 1981–92 (4.5 to 6.0) (p<0.0001). The results showed that later introduction of gluten during 1971–92 was associated with a declining incidence of coeliac disease and an increased age of presentation. Figure 2 shows that during 1971–80, 72% of children with coeliac disease and 74% of controls were initially bottle fed, and 28% of children with coeliac disease and 26% of controls were initially breast fed. During 1981–92, 87% of children with coeliac disease and 69% of controls were initially breast fed and 13% of children with coeliac disease and 31% of controls were initially bottle fed. Proportions of children with coeliac disease and controls initially breast or bottle fed (%). Table 2 shows that during 1971–92, gluten was introduced later to breast fed than bottle fed children with coeliac disease (p=0.03) and to breast fed than bottle fed controls (p=0.01). Breast fed children with coeliac disease were diagnosed later than bottle fed children with coeliac disease (p=0.03). 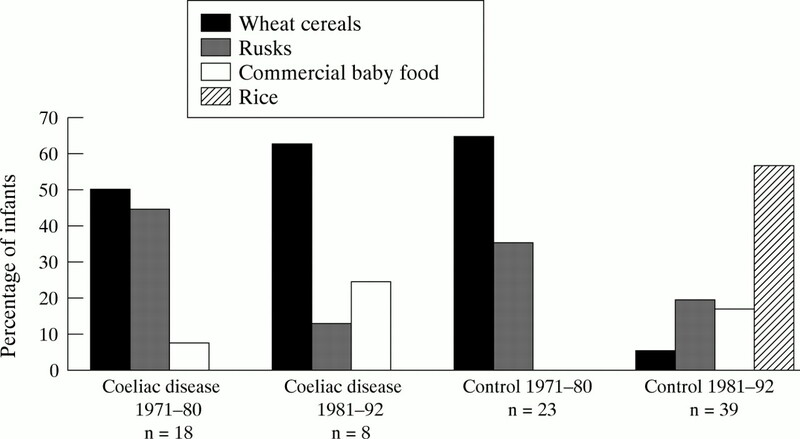 Figure 3 shows that children with coeliac disease during 1971–80 were initially weaned onto foods containing gluten, such as wheat cereals (50%), rusks (45%), and commercial baby foods (5%), and during 1981–92 onto wheat cereals (63%), rusks (12%), and commercial baby foods (25%). Controls during 1971–80 were also weaned onto wheat cereals (65%) and rusks (35%), but during 1981–92 onto wheat cereals (5%), rusks (20%), gluten free commercial baby foods (17.5%), and baby rice (milled rice with added thiamine) (57.5%). Weaning solids first given to children with coeliac disease and controls (%). In Sweden, a doubling of the gluten content of proprietary baby foods was associated with an increased incidence of coeliac disease, from 1.7 children per 1000 live births during 1978–82 to 3.5 per 1000 thereafter.9 10 This occurred in spite of an increased prevalence and duration of breast feeding, and delay in the introduction of dietary gluten from 4 to 6 months.10 The clinical response to gluten in patients with coeliac disease is known to be dose dependent,29 30 and an overall reduction in the amount of gluten given during infancy could have been another factor contributing to the declining incidence of coeliac disease in West Somerset. In this study, the findings suggested that changing infant feeding practices contributed to the declining incidence of coeliac disease during 1971–92 and to the disappearance of TGI.15 The dietary findings supported the recommendations made by the DHSS Working Party of the Panel on Child Nutrition in 1974.24 Also that baby rice and gluten free foods should initially be given to wean infants onto solids and that dietary gluten should be avoided until at least 5 months of age. We are grateful to the staff of the children’s unit, Taunton and Somerset Hospital, for their assistance with this study and to Mrs Trish Hilton, Dr Paul Ewings, and Mrs Katharine Kent. Also to Professor BA Wharton and Dr JA Black for their useful comments and to the trustees of the Somerset Children’s Research Unit for their valuable support. (1980) Childhood coeliac disease is disappearing. Lancet ii:1359. (1980) Childhood coeliac disease is disappearing. Lancet ii:1360. (1981) Childhood coeliac disease is disappearing. Lancet i:322–323. (1985) Changing patterns of coeliac disease frequency; an analysis of coeliac society membership records. Gut 26:175–178. (1986) Prevalence and ‘incidence’ of celiac disease in Edinburgh and the Lothian region of Scotland. Gastroenterology 90:334–342. (1987) Decreasing incidence of coeliac disease. Arch Dis Child 62:465–468. (1989) Unchanging clinical picture of coeliac disease presentation in Campania, Italy. Eur J Pediatr 148:610–613. (1988) Changing pattern of childhood coeliac disease in Finland. Acta Paediatrica Scandinavica 77:408–412. (1991) Increasing incidence of coeliac disease in Sweden. Arch Dis Child 66:608–611. (1992) Increasing incidence of coeliac disease in Sweden. Results of a national study. Acta Paediatr 81:589–592. (1983) The incidence of coeliac disease and early weaning. Arch Dis Child 58:326. (1970) Diagnostic criteria in coeliac disease. Acta Paediatrica Scandinavica 59:461–463. (1990) Revised criteria for diagnosis of coeliac disease. Report of working group of European Society of Paediatric Gastroenterology and Nutrition. Arch Dis Child 65:909–911. (1976) Criteria for the diagnosis of temporary gluten intolerance. Arch Dis Child 51:275–278. (1987) Transient gluten intolerance. Does it exist? Neth J Med 93:1356–1362. (1950) Incidence of the sprue syndrome with some observations on the natural history. BMJ 1:1157–1161. (1964) Possible factors in the incidence of coeliac disease. Acta Paediatr 53:109–116. (1959) The inheritance of coeliac disease. Ann Hum Genet 23:266. (1969) Inheritance of coeliac disease. J Med Genet 6:129–131. (1988) Gluten-sensitive enteropathy in childhood. Pediatr Clin North Am 35:157–187. (1967) Dietary study of 4365 Scottish infants:1965. Scottish health service studies No 6. (HMSO, Edinburgh), p 89. (1973) Incidence of coeliac disease in the West of Ireland. BMJ i:703–705. (1974) Coeliac disease: the disorder in childhood. in Clinics in gastroenterology. eds Cooke WT, Asquith P (Saunders, London), 3:127–144. (1974) Present-day practice in infant feeding. Report on health and social subjects No 9. (HMSO, London), pp 24–26. (1991) Early diet and later disorders of the gut. Bulletin of the British Nutrition Foundation 16 (suppl) 74–91. (1982) A quinquennium in infant feeding. Arch Dis Child 57:895–896. (1982) Infant feeding: 1980. (Office of Population Censuses and Surveys, London), pp 21–26. (1990) Infant feeding: 1990. (Office of Population Censuses and Surveys, London), pp 8–32. (1975) Small-intestinal histology in coeliac disease. Lancet i:1345–1346. (1979) Reintroduction of gluten in adults and children with treated coeliac disease. Gut 20:743–749.